We’d love your help. Let us know what’s wrong with this preview of Enjoying God by S.J. Hill. "What greater way could you glorify God in your life than by simply enjoying Him?" teacher and author S.J. Hill asks. "It's simple, but it's radical. Some may even call it revolutionary. Yet, I believe this is the heartbeat of Christianity. It's all about relationship with our heavenly Father, the true Lover of our hearts." Enjoying God challenges and encourages believers of all ages to pursue a passionate and intimate relationship with God. It exposes how misunderstandings of the Creator can damage and jeopardize your faith, and uncovers a biblical understanding of God as Father. This book will move you from duty to delight in your relationship with Christ. 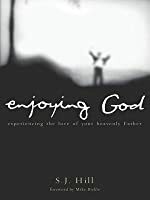 Enjoying God features a foreword by best-selling author Mike Bickle. To ask other readers questions about Enjoying God, please sign up. This book takes me out of legalistic intellectualism into relationship with a Father who wants His best for me--so much so that Jesus came, lived, died and rose again to restore me from sin and death to life and purpose for now into eternity. it'd be an understatement to say I'm not overly familiar with the gentle side of God, so reading this book was difficult. I read it, but I already had my opinion locked and loaded, and had to fight my instincts to put the book down every time I read something that I was unfamiliar with or when something bothered me. But.. it does bother me when God is described as a groom kissing his bride. it makes the supernatural so natural. Maybe I just don't understand metaphors. - it's nice and nec it'd be an understatement to say I'm not overly familiar with the gentle side of God, so reading this book was difficult. I read it, but I already had my opinion locked and loaded, and had to fight my instincts to put the book down every time I read something that I was unfamiliar with or when something bothered me. - it's nice and necessary to hear that you are loved and chased after by God. - comparisons and stories from Greek mythology. - More quotes from other books than actual Bible verses. or so it seemed. - "Kiss me with the kisses of your Word"
- God is wild and romantic? - "the gospel is a divine romance"
Overall, a decent devotional book. Great book for my FYI students given our topic at hand: The Heart of the Father. Excellent in conjunction with Lifetime Guarantee which clearly dilineates trichotomy. While there are a few things I didn't see eye to eye on with the author, so I am rating this book based on the positive things I read. I love the stories, quotes and his discussion on the love of God. I would recommend this to friends, however, I would have to caution them on a few concepts that I didn't think were as biblically sound as the rest of the book. Great book. Aways goes along with my Bible. Anyone who wants to experience and here about how much God loves them and desires them needs this book. Total life changing for me, It rocked my very core and brought me alot further along in knowing and understanding Gods love for me..
this book was a bit trite and cliche at times - while it seems better suited for a new christian, it was a good reminder of things that i had somehow forgotten. by the end, it redeemed itself, i think. This book was one of those that helped to propel me into the person that I am and how I think of God. If you've come from a performance-based, legalistic religious background and are looking to come out from under that weight, this book is a must read! I read this book years ago, and the Lord used it (among other things) to draw me to a deeper place of intimacy with him like I had never known. I've never been the same. This is one of my top 10 favorite books of all time. Insightful in the "everyday uses" type of way. So many relevant practices for your day-to-day walk. Recommend it as an accommodating devotional.